"F­­rom a performance standpoint, travel, food, just important things, facilities that really help performance, it's important," she said. "And I'd be lying to say that things don't need to be better, because they do need to be better, and hopefully I can help." General manager Tony Novo was grilled by reporters at Rutgers' Yurcak Field, Sky Blue's home venue — and one of its biggest problems. It's a fair facility for college soccer, but its locker rooms aren't fit for professionals. They lack showers and standard fitness equipment. How is a locker room that lacks showers fit for college soccer? It's not. I actually live pretty close to Rutgers. the field is below high school standards. I don't go to games because it's a terrible facility. There's no parking lot, you park on grass and when it's been raining all week, it's impossible to get out. I hope and pray that either the RedBulls or NYCFC buy the team. I'm not surprised no one wants to play for them. They'll be just as bad next season unless things improve. reports are coming out that SkyBlue may fold this offseason with NYCFC possibly being granted an expansion team for 2020 along with LAFC. NWSL is looking to restructure itself this offseason and may not add any expansion teams. So down to 8 teams for 2019...UGH. Of course it's not a definite. But when players and STH are protesting the team it's not a good sign. I keep hoping NYRB or NYCFC will buy this team. The Sky Blue front office is just a joke. It would be sad to lose another team if they fold and it would look horrid for the league from a perception standpoint to lose 3 teams in 2 years. More details on the Sky Blue mess and if any of their draft picks will show up. SkyBlue Top draft picks to bail on team. 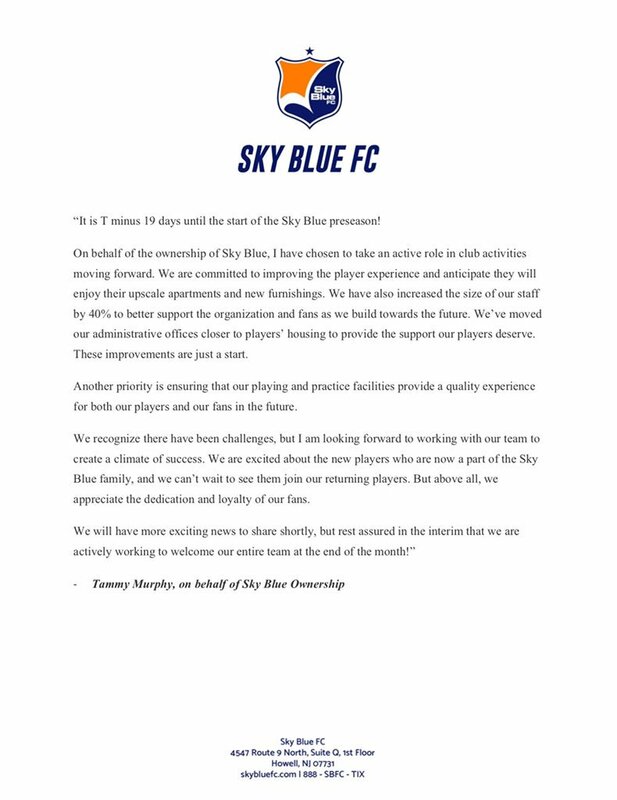 SkyBlue make statement on upcoming season and player's living conditions.